McIlroy recovered from a double bogey at the 14th with birdies at two of his last three holes 69 that left him five shots adrift of clubhouse leaders Ryan Palmer (63) and Sean O’Hair (64) on four under par. 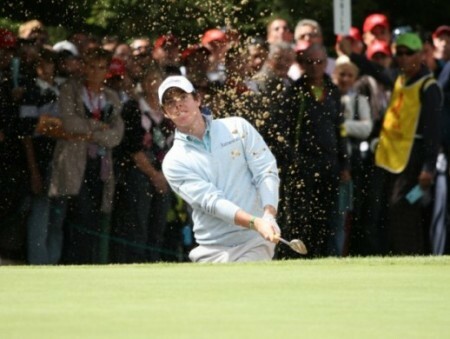 McIlroy said: “It was nice to get a couple in there after the double on 14. I am still in there, hopefully no more than five back so I can give it a run tomorrow. “I played nicely on the front nine but didn’t hit many fairways on the back nine but did well to hang in there with only ten putts. “I feel I am playing well and it is looking good for tomorrow and next week. I am happy with where my game is at and it would be nice to finish with a good one going into the PGA. US Open champion McDowell revealed that he was still battling to shake off a bug that affected him in Friday’s second round 73. Despite an ice cold putter, he missed just one fairway as he posted a two under 68 to lie just six shots off the pace on three under par. Relieved that he has shaken off a bug that could have wrecked his US PGA chances, McDowell said: “I thought I might have picked up some kind of bug yesterday so I went home and dosed myself up with vitamins and Advil, slept it off and felt better this morning. McDowell has one eye on the last major of the season but knows that a decent final round will be worth huge world ranking and Race to Dubai points. After mixing four birdies and two bogeys, he said: “I played good today, really good. I just didn’t get the putter heated up at all. I hit a lot of quality iron shots today and drove it really well on the back nine especially. 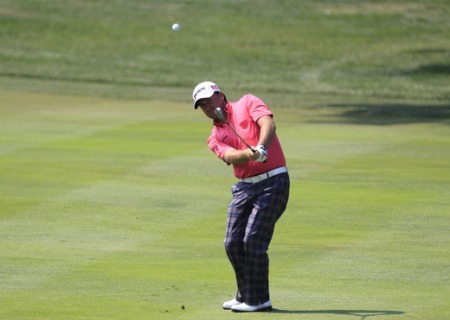 Padraig Harrington was frustrated to shoot a level par 70 to slip eight shots off the pace on one under. Confessing that he had one eye on next week’s US PGA, Harrington said: “I hit it close enough today, as close as I have ever hit it in a round of golf and if I had putted half decent I would have been challenging. Petrol head Graeme McDowell is hoping to do a Tiger Woods and get on his bike for two massive weeks in the US. As Woods bounced back to form by capturing the Buick Open in sensational style last week, the bike-mad Ulster ace "relaxed" by taking a 140 mph white knuckle ride around the Kirkistown circuit on the Ards peninsula with Suzuki TT stars Bruce Anstey and Cameron Donald. Now McDowell wants to burn it up in the town they call Rubber City when he tees it up in this week's WGC-Bridgestone Invitational at Firestone Country Club in Akron before heading Minnesota for the US PGA. Padraig Harrington pumps his fist after cleaning up a poor day with an eagle worth five points in the Reno-Tahoe OpenAs Rory McIlroy, Graeme McDowell and Michael Hoey failed to get into the red at the WGC-Bridgestone Invitational in Akron, Padraig Harrington closed with an eagle three at Montreaux Country Club to end up in the black in the Reno-Tahoe Open. Graeme McDowell pitches to the par-five 16th in the second round of the WGC-Bridgestone Invitational. Photo Eoin Clarke/www.golffile.ieGraeme McDowell and Rory McIlroy shot a pair of three under 67s to keep their minds on the job heading in the final two rounds of the WGC-Bridgestone Invitational in Akron.